Yesterday I got an email from my coworker about an approved law for our city which I feel abuses the authority of the municipality through excessive power which infringes on the Constitutional rights of the homeless who are all over the place downtown. So, as many of you would, I shared the article on Facebook with a challenge for the Church to make some sort of statement about this. After posting, a good friend from my Church, an older man whom I respect, challenged my position with his own. Now at first I was ready to argue, because let’s face it, that’s kind of what Facebook has become, a series of interconnected soap boxes and if you feel strongly that you are right, you defend your position. But thankfully the Holy Spirit reminded me of HIS position regarding not only this new law, but also on the authority of my elders in the Church and in the community and my relationship with them as a man under their authority which is derived from God. What could have ended up as an argument with a friend ended up a civil discussion with a Christian brother where I could see that we agree for the most part, but disagree on some of the details, which as I feel compelled to mention: IS OKAY. An argument ensues. Someone disagrees and responds (often times arrogantly) which prompts another response, and the next thing you know it’s an all out flame war with friends, family, and acquaintances. 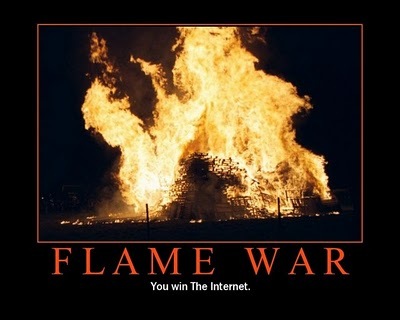 This trend of flaming others is troubling to me. Not because people have strong convictions and opinions, but because they often times come out in a way that is very unloving so as to win arguments. It seems like we’ve lost the ability to discuss, learn, and grow from one another. …so that it will give grace to those who hear. There is a way to lovingly disagree and harbor a discussion with someone without belittling them so that you can be victorious and glorify your name with “Likes”. I would suggest emailing them, or messaging them, or calling them, and if you have the opportunity, talk with them in person (I know… that’s crazy… but try it).